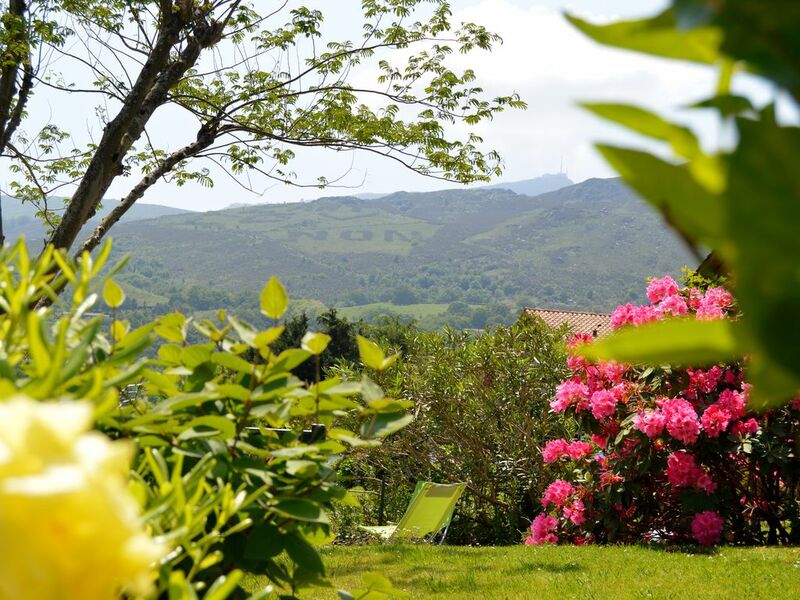 Between sea and mountain, you will occupy an apartment on the ground floor of a Neo-Basque villa with an independent entrance. In peace, its 2 rooms and the room of life overlook the private garden with a clear view on the mountains. On the large terrace of 21 m2 you can lunch in the shade of the silk tree looking at our beautiful mountain Rhune. The heart of the village with its shops, restaurants and entertainment is 5 minutes walk. Many walks, accessible to children, are possible from ascain. Baby kit available free on request. The bathroom has 2 sinks and an open and spacious shower. Great location, very good accommodation. The Basque region either side of the border is wonderful. Très bel appartement en r. de ch. surélevé, dans un cadre de petite montagne verdoyant. Belle exposition E.S.E. dont le jardin offre vue exceptionnelle sur la fameuse RHUNE..
Oui, nous avons vécu un excellent séjour dans une belle location et un bel environnement entre Océan et Montagne, dont un très bon moment au sommet de la RHUNE. Wir haben zu fünft einen sehr schönen Urlaub in dieser Wohnung verlebt. Sie ist genau so, wie beschrieben und wie auf den Fotos zu sehen ist - schön eingerichtet und sauber. Die Vermieter wohnen im gleichen Haus über der Ferienwohnung, was aber kein Problem ist, da sie sehr nett und zurückhaltend sind. Da das Haus an einem Hang liegt, befinden sich die beiden Gärten auf den entgegengesetzen Hausseiten. Und da die Gärten der benachbarten Häuser nicht direkt angrenzen hat man einen relativ gut "geschützen" Bereich. Das Haus liegt in einem Wohngebiet an einer Sackgasse. Wir haben die Ruhe dort sehr genossen! Von dort aus kann man auch sehr schöne Ausflüge machen. Obwohl man im fußläufigen Ort alles bekommt, was man zum täglichen Bedarf benötigt, ist man doch auf ein Auto angewiesen. Zum Strand sind es ca 20-30 Autominuten. Hier wäre es sinnvoll, Fahrräder dabeizuhaben, da die Straßen zu bestimmten Zeiten doch etwas voll sind :-). Alles in Allem eine sehr zu empfehlende Ferienwohnung! Séjour très agréable et un accueil chaleureux du propriétaire et de sa famille. Très belles prestations et l'endroit est magnifique entre mer et montagne.Idéal pour un couple avec enfants. Nous y retournerons certainement et avec un très grand plaisir dès que possible avec toute la famille. Ascain is ideally placed. Slightly away from the coast and the influx of Saint Jean de Luz, one reaches the golf courses and the sea in minutes. The beaches of Saint Jean de Luz are 8 km, the large beach in the bay of Saint Jean is protected from the waves by dikes and alternates swimming and walks in the city center; Erromardie beach will allow you to play with the waves and introduce you to the joys of skiing (surfing, body ...). Hendaye Beach with its large expanses of sand is a playground for children. Golf: The Nivelle Golf Course, opened in 1907, is built on an old quarry. Located in the municipality of Ciboure, it is a hilly course. Its environment provides the beauty of the sea, the view of the port of Saint-Jean-de-Luz and the fullness of the mountain. Many varieties of trees along the way. It would be unforgivable not to look up and admire the panorama that awaits you at hole 17, regardless of your card. Nivelle is not easy. It requires a lot of precision on the second shot, the greens are often very steep and you'll sometimes uncomfortable position because of the hilly course. La semaine s'entend du samedi 16h00 au samedi 10h00 Location du linge de lit et / ou du linge de toilette en option Kit bébé disponible gratuitement sur demande.